We are luxury Norfolk dairy ice cream makers based in Norwich, manufacturing the finest quality ice cream and sorbet using fresh, local, natural ingredients wherever possible. Proud suppliers to some of the best restaurants in the region, and caterers to weddings, events and parties. New for 2019! New look 100% Bio-degradable 100ml & 500ml tub range. 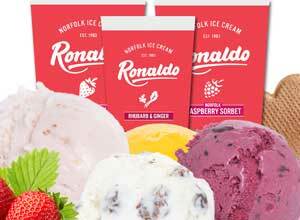 Ronaldo Ices are proud to introduce our new look range of retail and impulse tubs. The same great local ice cream in revamped, 100% biodegradable packaging. Available for 2019, contact us to register your interest and find out more.